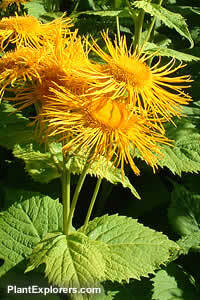 Robust perennial with thick downy stems that bears bright yellow daisy-like flowers, 3 inches across, in late summer. Height 3-6 feet. The genus Inula is now in the family Compositae. For maximum freshness, please keep seed refrigerated in its original packaging until it is time to plant. Sow seed in containers in a cold frame in spring or fall. Grow in deep, fertile, moist but well-drained soil in full sun.